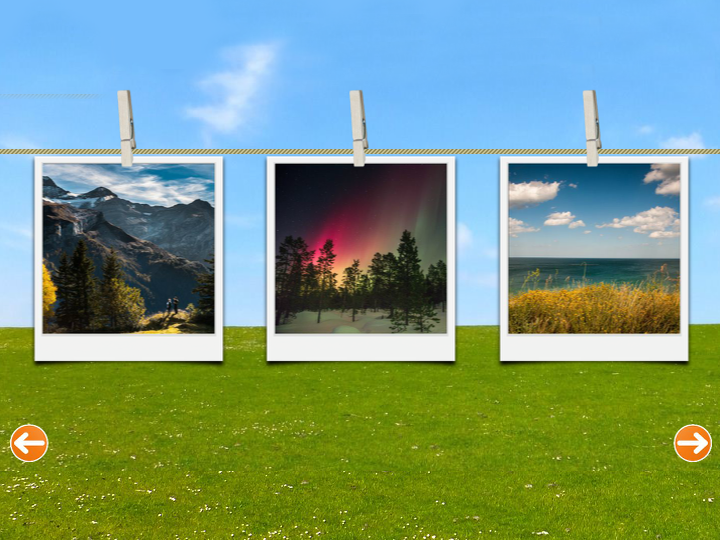 This week's E-Learning Heroes challenge was to create an image slider. I wanted to create something a little different than the common image slider found on many websites. So I found an example on Slide Deck that showed Polaroid pictures scrolling across the screen. First I built a prototype with colored squares just to see if I could figure out how to make it work. Once I got it working, I found a background image, Polaroid picture frame and clothes pin on Creative Commons. I used Photoshop to remove the background on the clothes pin image and rotate it so it would look like it was clipped to a clothes line. The clothes line was created with a rectangle, filled with a diagonal pattern. I found the photograph images on Unsplash. On the baselayer, I laid out the slide how I wanted it to look. I included all six pictures that would be in the image slider. Then I duplicated this layer (Right 2 3 4) and used a motion path with a trigger to move the images to the right when the layer timeline began. Then I duplicated this layer (Right 3 4 5). 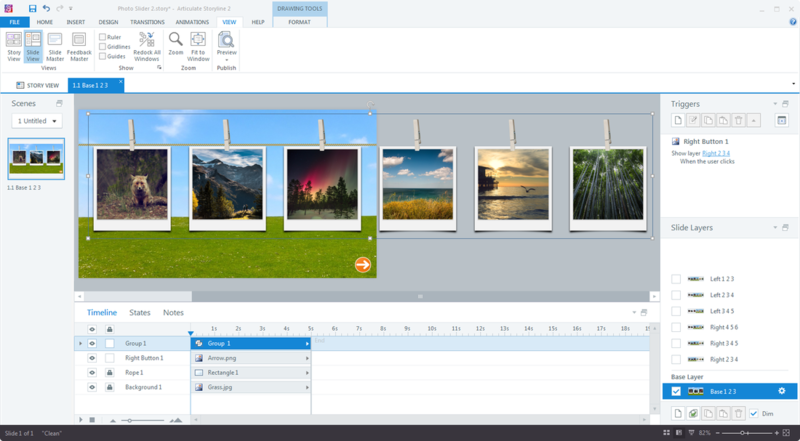 By duplicating the layer, the motion path and trigger was already in place; however, I needed to move the group of pictures to the right one picture so when the layer began, the correct pictures were displayed and then moved. I repeated this process one more time for layer, Right 4 5 6. Next, I needed to repeat this process three more times, but instead of the pictures moving to the right, they would move to the left. Lastly, I added the left and right arrows and linked them to the appropriate pages. Feel free to download and use the Storyline file.